10 nights from £1,335 per person. Two Week Cultural Discovery Tour In Senegal and Gambia with a River Cruise. 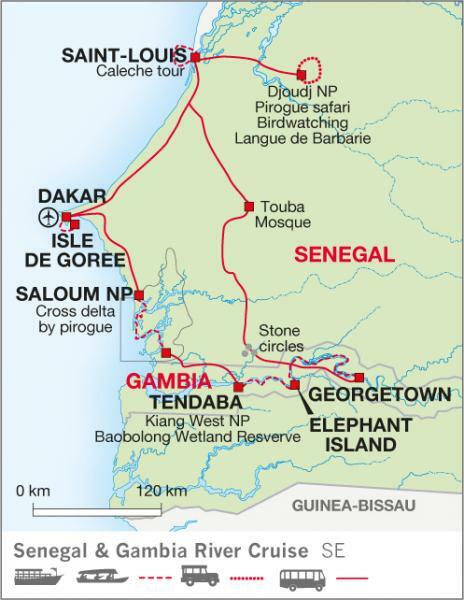 On this holiday in West Africa we discover two different nations: tropical Gambia and exotic Senegal. We walk through French colonial towns, see prolific birdlife and visit the megalithic stone circles at Wassu. We also explore some of the region's finest wildlife parks, cruise down the Gambia River and venture into the Saloum Delta by traditional pirogue canoe. Djoudj – One of the most important bird sanctuaries in the world. Gambia River – A two day cruise on the mighty Gambia River through tropical forest, bamboo groves, rice paddies and mangroves. Saloum Delta – Explore the river delta by traditional pirogue through mangroves and aquatic birds. Isle de Goree – A tranquil island rich in history and a UNESCO World Heritage Site. Fadiout – A charming fishing village entirely constructed with shells. Saint Louis – Visit a 19th century French colonial town by caleche. Wassu Stone Circles – Ancient burial sites and megalithic circles. Spectacular views, fantastic bird watching, vibrant cities and palm-fringed beachesSenegal and Gambia are renowned for their fantastic bird life and vibrant culture….